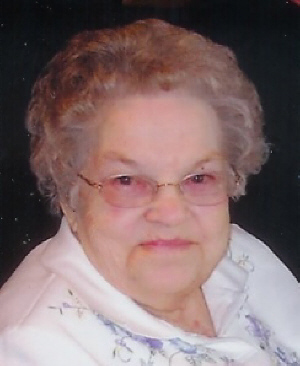 Donna L. Denman, age 86, of Marysville, died Saturday December 5, 2009 at 1:30 AM at Gables at Green Pastures in Marysville. She was born February 1, 1923 in Marion County to the late Gerald and Esther (Schlecht) James. On September 14, 1941 in New Bloomington she married William W. (Bill) Denman and he died October 25, 2002. Surviving are son; Kenneth (Carol) Denman of Marysville, and Keith (Marcia) Denman of Greenville, Ohio. Donna was very proud that both her sons served and retired from the U S Navy. Also surviving daughter Constance (Barry) Reese of Plain City. Grandchildren: Kent Grose with friend Johna Norton, Jayson (Ronda) Denman, Chad Denman, Scott Denman, Kristy (Todd) Suszek, Julie (Craig) Barhorst, and Placido Martinez III. Great Grandchildren: Jillian Denman, Sydni Denman-Moyer, Adam Suszek, Tiffany and Edward Martinez. Special friend and caregiver June Curtis. She was preceded in death by son Thomas Eugene Denman, twin brother Donald L. James and Grandson Kirk Grose. Mrs. Denman was a homemaker, worked at O. M. Scotts was a member of the O.M. Scotts 20 year club, Graduate of New Bloomington (Agosta) High School. After marriage she lived in Meeker then moved to Byhalia in 1956 and after her husband died she moved to Marysville. Member of the Women of the Moose #863 Kenton, Ohio, member of the former Town and Country Mothers Club of Byhalia, Member of the Navy Mothers Club of Richwood then after retirement she worked with God’s Life Line at Mt. Victory. Funeral Services will be held Wednesday December 9, 2009 at 11:00 AM at the Stofcheck-Ballinger Funeral Home in LaRue. Minister will be Pastor Jack Knox. Burial in the LaRue Cemetery. Friends may call at the funeral home in LaRue Tuesday December 8, 2009 from 4 to 8 PM. Those who wish may make contribution to the Union County Humane Society. Wishing you comfort at this time of loss...and hoping you will find peace and healing in the many warm and special thoughts that are with you now. Just received notice of your Mother's death. My thoughts and prayers are with you. I lost my mother almost 22 years ago. I am so sorry for the loss of your mom. I remember you from years ago graduating with my brother, Doug, and being a part of the Youth Group at the Byhalia Friends Church. I remember the times spent with Connie also when I was younger when Sandy was little and she babysat while mom was going to college. So many memories come back,again, I am so sorry! My prayers are with each of you. Mother & I send our sincere condolences on the death of your dear Mother. How blessed we have been to have our Mothers in so much of our lives. Due to the weather and Mothers rather frail condition, we will not be able to attend the Funeral. Our Moms worked at Scotts together and of course both lived in the Windsor Manor Apts. We will be thinking of your family during this difficult time. I am so sorry to hear of the passing of your mother, Donna. She will be missed at the Scotts 20 Club functions that she always attended. My Mom always loved to work with your mother at Scotts as well. I know that you lovingly took care of her during her illness. As much as we would like to be able to fix things, we know that she was in the Lord's hands and not suffering any more. You are in my thoughts and prayers during this difficult time. I won't be able to come to LaRue for calling hours tonight but did want to let you know I have been thinking about you and keeping you in my prayers. To know that our thoughts are with you in your time of need. It has been quite some time since I've seen you, but Mom (Gladys Amrine) would call your mom occasionally. We visited in Marysville a couple of times. Your mom was always smiling and a joy to talk with. We discussed going to the visitation, however the weather was not the best and Mom (age 88) felt it would be better for her to stay home. Mom lives in an apartment just 2 blocks from me in Leipsic, 23 miles west of Findlay. She has lived here since 2005 (2 years after Dad passed away). I have fond memories of visits when we were all younger and you lived in Byhalia. Know that our thoughts and prayers are with you all. You have our greatest sympathy and we understand how hard it is. We didn't hear about your loss until we saw the Richwood paper. Susan and I are keeping you in our prayers.